The Australia government is investigating the creation of a new Temporary Parent Visa for parents wanting to visit family in Australia. 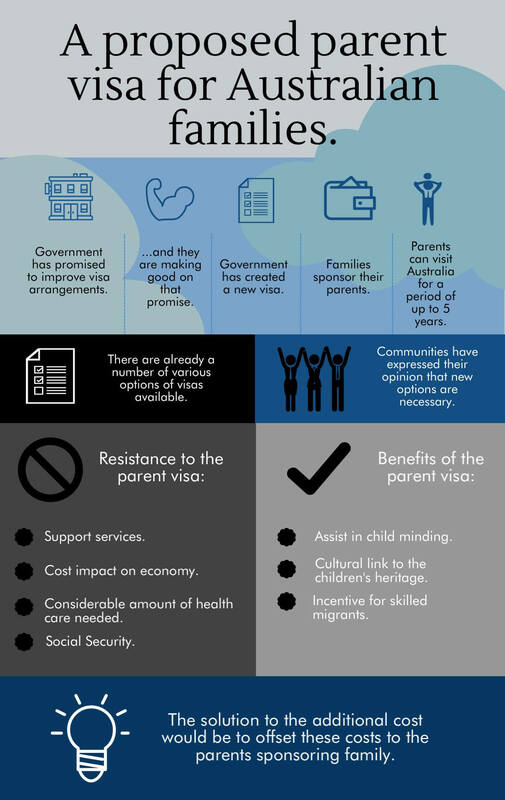 The proposed Temporary Parent Visa would enable sponsored parents to visit their families in Australia for a continuous period of up to five years. The government believes that parents should have the opportunity to visit family for an extended period of time, as long as they meet community expectations in a positive way. This means being a law abiding citizen and adhering to environmental regulations. Another key factor is that visiting parents do not have an undue cost impact on the economy. Although there are already various visas available for visitors to spend time with loved ones in Australia, the Australian community has expressed that new options are necessary, and that a new approach needs to be taken. Therefore, The Australian government is seeking community input to help shape the development of the visa. If you would like to have your say, you can send your written submission to: temporary.parents.visa@border.gov.au. Like any change, there comes adversity and various issues have however been raised around the adequacy of existing services to support these families. Have a look at the options listed on our website, or get in touch for a personalised consultation.